The Kingsport Mets' 2018 campaign came to a close on Sunday evening as they fell 5-2 in the decisive third game in the Appalachian League West Division Series. The Twins took the series opener at Hunter Wright Stadium, with the difference coming in a four-run seventh inning that ballooned a two run lead to a six run lead for the visitors. Willy Taveras took the loss for the K-Mets, but pitched well on the evening. Taveras earned a quality start by going six innings and allowing three runs while striking out five. Unfortunately for the Mets, Taveras was outpitched by his counterpart Joshua Winder. Winder also went six innings, but allowed just one run and four hits, while striking out six and walking none. With their season on the line and the series shifted to Elizabethton, the Mets bounced back in one of the craziest games of the year. Kingsport plated three runs in the opening frame and looked well on their way to blowing out Elizabethton, but Twins' starter Luis Rijo settled in and kept the Mets there, despite allowing nine hits over five. Kingsport starter Daison Acosta was tremendous, allowing just two runs and three hits over 5.1 innings, while striking out eight. Unfortunately for Kingsport though, the Twins were able to scratch across runs in the second, fourth, and seventh to tie the game. The Mets' pen of Marbin Montijo, Brian Metoyer, and Mitch Hickey were able to piece it together and get the game into extras. In the 10th, the Mets' offense broke through. Mark Vientos ripped a one-out, two-run double to break the 3-3 deadlock, and then Ranfy Adon knocked a clutch two-out, two-run single to give Kingsport a seemingly insurmountable 7-3 lead. However, Elizabethton wouldn't go quietly. The Twins put up three runs before the first out was recorded in the 10th, and had the tying and winning runs in scoring position, but Nelson Leon came in to record the save and send the series to a Game Three. 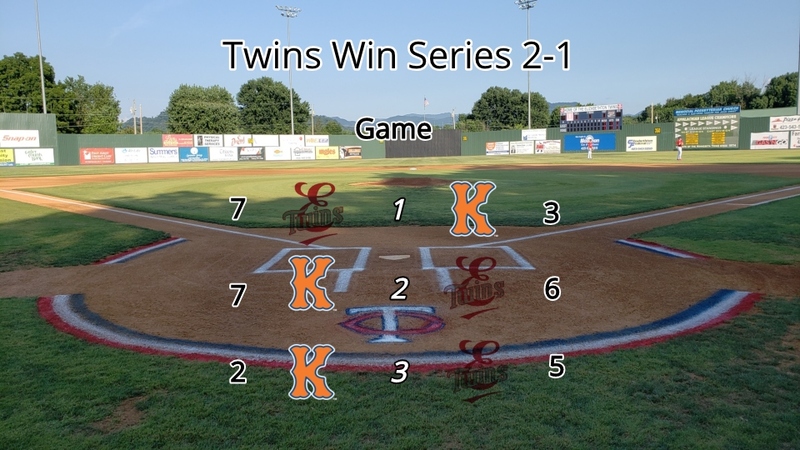 The Twins were able to close out the K-Mets Sunday evening by winning the decisive Game Three at Joe O'Brien Field 5-2. The Mets struck first in the top of the second on a sac fly by catcher Domingo Martinez, but that would be the only lead of the evening for Kingsport. The Twins struck for single tallies in the second, seventh, and eighth, as well as a two-spot in the fifth. Kingsport's lone other run came in the sixth on another RBI by Martinez, this one coming off a single to shallow right. That single by Martinez was Kingsport's lone hit with runners in scoring position in six chances. Kingsport stranded ten runners on base. The Twins will go on and face off with Princeton in the Appalachian League Championship Series. 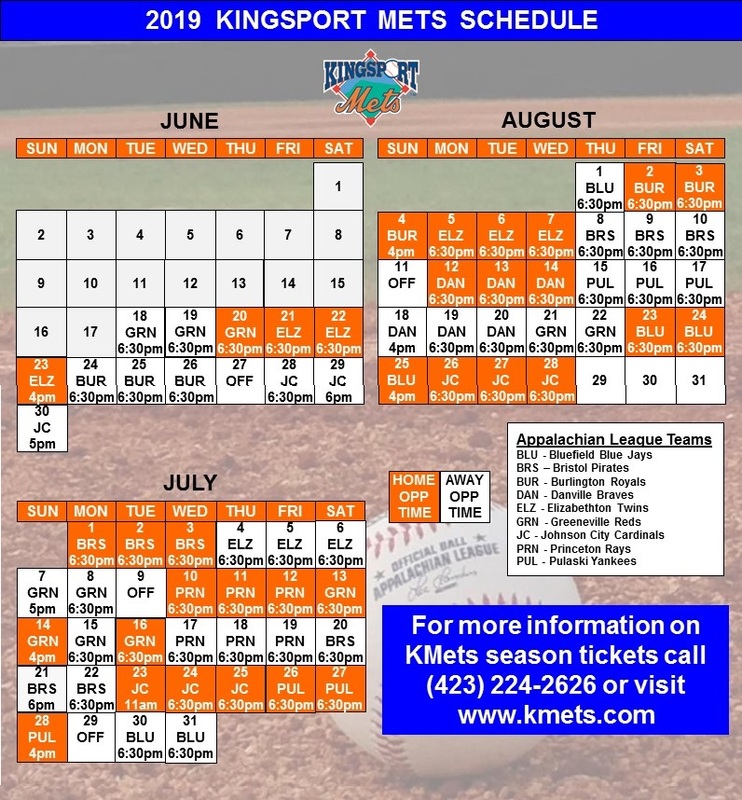 The Kingsport Mets' season has officially ended, just three victories short of an Appalachian League Championship. The K-Mets would like to thank the players, families, staff, and the fans for a tremendous 2018 season. We cannot wait for 2019 and look forward to seeing everyone out at Hunter Wright Stadium.